The cable networks of NBC were up next at the TCA Winter 2015 Press Tour yesterday and we have the full scoop! First off, USA Network has announced it has canceled its freshman comedy series Benched starring Eliza Coupe and Jay Harrington. Next up, Syfy and The Asylum announced that the original Sharknado survivors will return for the most epic shark attack yet! Ian Ziering and Tara Reid will reunite for the global pop culture sensation Sharknado 3, reprising their roles as Fin and April, respectively. 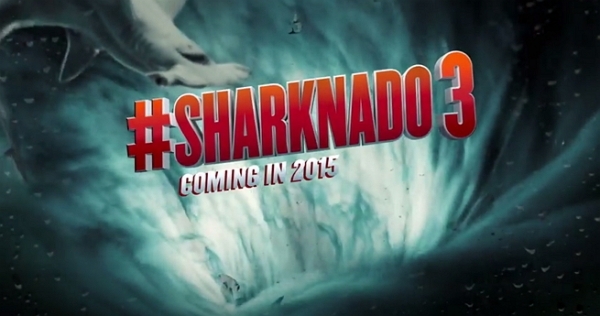 Premiering on Syfy in July 2015, Sharknado 3 will cause mass destruction in the nation's capital, Washington, D.C., than roar down the Eastern Seaboard. On to E! Entertainment, they announced the second season pick-up of the network's first original scripted series, The Royals, in advance of its first season premiere on Sunday, March 15 at 10pm ET/PT. Elizabeth Hurley and Vincent Regan star as Queen Helena and King Simon. Meanwhile, Bravo had some news, too. The network announced that the second original scripted series, Odd Mom Out, will premiere on Monday, June 8. The network also unveiled greenlights for many of its returning reality series. Furthermore, Bravo expands its scripted slate with the development of The One, from executive producer Charlize Theron and Universal Cable Productions enhancing the network's high quality original line-up. The 10 episode half-hour comedy, Odd Mom Out, stars acclaimed author Jill Kargman playing a satirical version of herself as she navigates the treacherous and elite ecosystem of New York's Upper East Side, and the uber-wealthy mommy clique inhabiting this fantastically outrageous domain. That's all that was of note to us, but some good stuff here! NBC itself is up today, so stay tuned for a recap on Monday. For the week of Jan. 19-26, 2015, we have many current sitcom stars and past sitcom stars on TV talk shows! All times listed are Eastern. So get your DVRs (or whatever you use) ready! Ready? Here is all what you need to know for the coming week! Kathy Griffin (Suddenly Susasn) - Watch Kathy on a repeat of The Late Show with David Letterman at 11:35pm on CBS. Abbi Jacobson and Ilana Grazer (Broad City) - Abbi and Ilana are guests on Jimmy Kimmel Live! at 11:35pm on ABC. Jim Gaffigan (My Boys/Welcome to New York) - Jim guest co-hosts The Late Late Show at 12:37am on CBS. Michael Ian Black (Ed) - Michael visits The Late Late Show at 12:37am on CBS. Ashley Williams (How I Met Your Mother/Good Morning, Miami) - Ashley stops by The Late Late Show at 12:37am on CBS. Don Cheadle (The Golden Palace) - Don appears on Late Night with Seth Meyers at 12:36am on NBC. Patton Oswalt (The Goldbergs/The King of Queens) - Patton is a guest on @midnight on Comedy Central at midnight. Rob Lowe (Parks and Recreation) - Rob drops by Conan at 11pm on TBS. Jay Baruchel (Man Seeking Woman/Undeclared) - Jay visits Conan at 11pm on TBS. Kevin Hart (The Big House/Undeclared) and Josh Gad (1600 Penn/Back to You) - Kevin and Josh talk about The Wedding Ringer on Watch What Happens: Live at 11pm on Bravo. Retta (Parks and Recreation) - Retta appears on a repeat of The Talk on CBS at 2pm ET/1pm CT-PT. She will also be on The Real, so check your local listings. Jennifer Aniston (Friends) - Jennifer chats on The Ellen DeGeneres Show, so check your local listings. Jon Cryer (Two and a Half Men) - Jon is a guest on a repeat of The Queen Latifah Show on your local station or at 3am on BET. Casey Wilson (Marry Me/Happy Endings) - Casey appears on a repeat of The Queen Latifah Show on your local station or at 3am on BET. Victoria Justice (Victorious/Zoey 101) - Victoria talks about her new MTV series on Wake Up with Taylor on SiriusXM Stars ch. 109 sometime between 6-9am. Mary Page Keller (Duet/Open House/Baby Talk) - Mary talks about Chasing Life on Home & Family on Hallmark Channel at 10am ET/PT. Mario Lopez (Saved by the Bell/Saved by the Bell: The College Years) - Mario talks about his family, Hollywood, awards season and more on HuffPost Live at 11:30am. Holly Robinson Peete (Hangin' with Mr. Cooper/For Your Love) - Holly discusses the latest hot topics on Access Hollywood Live, so check your local listings. Teri Polo (I'm with Her/Man Up!) - Teri is a guest on Access Hollywood Live, so check your local listings. Eric Stonestreet (Modern Family) - Catch Eric on Jimmy Kimmel Live! at 11:35pm on ABC. Olivia Munn (Perfect Couples) - Olivia stops by Conan at 11pm on TBS. Sarah Silverman (The Sarah Silverman Program) - Sarah appears on The Late Late Show at 12:37am on CBS. Kumail Nanjiani (Silicon Valley) - Kumail drops by The Late Late Show at 12:37am on CBS. Lauren Graham (The Odd Couple/Conrad Bloom/Townies) - Lauren visits Late Night with Seth Meyers at 12:36am on NBC. Rainn Wilson (The Office) - Rainn stops by Late Night with Seth Meyers at 12:36am on NBC. Melissa Fumero (Brooklyn Nine-Nine) - Melissa appears on a repeat of Last Call with Carson Daly at 1:35am on NBC. Rob Lowe (Parks and Recreation) - Rob is a guest on The Talk on CBS at 2pm ET/1pm CT-PT. Charlie Day (It's Always Sunny in Philadelphia) - Charlie visits The Ellen DeGeneres Show, so check your local listings. Mario Lopez (Saved by the Bell/Saved by the Bell: The College Years) - Mario and wife Courtney Mazza talk about how they keep their relationship hot and spicy in the kitchen on The Meredith Vieira Show, so check your local listings. They will also be on Fox & Friends at 7:35am. Kate Walsh (Bad Judge) - Kate is a guest on a repeat of The Queen Latifah Show on your local station or at 3am on BET. Lamorne Morris (New Girl) - Lamorne appears on a repeat of The Queen Latifah Show on your local station or at 3am on BET. Teri Polo (I'm with Her/Man Up!) - Teri talks about The Fosters on Home & Family on Hallmark Channel at 10am ET/PT. Alanna Ubach (See Dad Run) - Alanna discusses her new role in Girlfriends' Guide to Divorce on Home & Family on Hallmark Channel at 10am ET/PT. Martha Plimpton (Raising Hope) - Martha will be on New York Live on WNBC in New York at 12:30pm ET. Kristin Chenoweth (Kristin) - Kristin talks about Strange Magic and The Boy Next Door with the ladies of The View on ABC at 11am ET/10am CT-PT. Judith Light (Who's the Boss?/Phenom) - Judith chats with the ladies of The View on ABC at 11am ET/10am CT-PT. Casey Wilson (Marry Me/Happy Endings) - Casey is a guest on People Now at 8:30am. Jennifer Aniston (Friends) - Watch Jennifer on The Tonight Show Starring Jimmy Fallon at 11:34pm on NBC. She also talks about Cake on ABC's Good Morning America between 7-9am. Allison Janney (Mom/Mr. Sunshine) - Allison is a guest on a repeat of The Late Show with David Letterman at 11:35pm on CBS. Adam Goldberg (Joey) - Adam appears on The Late Late Show at 12:37am on CBS. Dave Koechner (The Office/Hank) - Dave visits The Late Late Show at 12:37am on CBS. Nick Kroll (The League/Cavemen) - Nick stops by Late Night with Seth Meyers at 12:36am on NBC. Rory Scovel, Emily Heller and Rene Gube (Ground Floor) - Rory, Emily and Rene are guests on @midnight on Comedy Central at midnight. Jason Ritter (The Class) - Jason appears on Conan at 11pm on TBS. Allison Williams (Girls) - Allison drops by LIVE! with Kelly and Michael, so check your listings. Lauren Graham (The Odd Couple/Conrad Bloom/Townies) - Lauren reveals what she's planning on stealing from the Parenthood set when the show ends on The Meredith Vieira Show, so check your local listings. She also talks about Parenthood on NBC's Today in the 9am hour. Kathleen Rose Perkins (Episodes) - Kathleen talks about Episodes on The Better Show, so check your local listings. Kevin Bigley (Sirens) - Kevin discusses Sirens on Home & Family on Hallmark Channel at 10am ET/PT. Rainn Wilson (The Office) - Rainn talks about Backstrom on HuffPost Live at 12:00pm. He will also be on Good Day New York on WNYW-Fox5 in New York between 7-10am. Eve (Eve) - Eve talks about her Lifetime movie With This Ring on NBC's Today Show in the 10am hour and on New York Live on WNBC in New York at 12:30pm ET. Joshua Molina (Sports Night) - Joshua is a guest on PIX11 Morning News on WPIX in New York at 8:50am and on WSJ Live at 1:30pm. Lena Dunham (Girls) - Catch Lena on The Late Late Show at 12:37am on CBS. Jennifer Aniston (Friends) - Jennifer is a guest on Comedy Central's The Daily Show with Jon Stewart at 11pm. Ron Howard (Happy Days) - Ron stops by Conan at 11pm on TBS. Judy Greer (Married/Arrested Development/Miss Guided) - Judy appears on @midnight on Comedy Central at midnight. Don Cheadle (The Golden Palace) - Don appears on LIVE! with Kelly and Michael, so check your listings. Simon Helberg (The Big Bang Theory) - Simon talks about his film We'll Never Have Paris on LIVE! with Kelly and Michael, so check your listings. He will also be on New York Live on WNBC in New York at 12:30pm ET. Amanda Peet (Togetherness/Bent) - Amanda dishes on her new show Togetherness on Rachael Ray, so check your local listings. Karen David (Galavant) - Karen performs on Home & Family on Hallmark Channel at 10am ET/PT. Rainn Wilson (The Office) - Rainn talks about Backstrom on NBC's Today in the 9am hour. Malin Akerman (Trophy Wife) - Malin talks about A Path Appears on NBC's Today in the 9am hour. Tony Danza (Who's the Boss/Taxi) - Tony discusses Honeymoon in Vegas on NBC's Today in the 10am hour. The cast of Honeymoon in Vegas performs. Eve (Eve) - Eve talks about her Lifetime movie With This Ring on PIX11 Morning News on WPIX in New York at 8:50am. Garry Shandling (The Larry Sanders Show/It's Garry Shandling's Show) - Watch Garry on The Late Late Show at 12:37am on CBS. Ron Howard (Happy Days) - Ron appears on The Talk on CBS at 2pm ET/1pm CT-PT. Melissa Joan Hart (Melissa & Joey/Sabrina, the Teenage Witch/Clarissa Explains It All and Joey Lawrence (Melissa & Joey/Blossom/Gimme a Break!) - Melissa and Joey are guests on The Real, so check your local listings. Simon Helberg (The Big Bang Theory - Simon discusses his directorial debut in We'll Never Have Paris on HuffPost Live at 3:30pm. He will be a guest on Good Day New York on WNYW-Fox5 in New York between 7-10am. He can be heard on The Morning Mash Up on SiriusXM Hits 1 at 10am. Judy Greer (Married/Arrested Development/Miss Guided) - Judy and the cast of Archer are guests on Larry King Now at 2/5pm PT/ET on Ora.tv and Hulu. Miley Cyrus (Hannah Montana) - Miley talks about her new collaboration with MAC cosmetics on ABC's Good Morning America sometime between 7-9am. Holly Robinson Peete (Hangin' with Mr. Cooper/For Your Love) - Holly is a guest on PIX11 Morning News on WPIX in New York at 8:15am. Joshua Molina (Sports Night) - Joshua chats with the ladies of The View on ABC at 11am ET/10am CT-PT. Tony Danza (Taxi/Who's the Boss?) - Tony is a guest on Morning Joe on MSNBC sometime between 6-9am.